If they ask me about it in the future then I have to describe it. I forced myself to fix it in my memory. Louis (also known as ‘Lou’ or ‘Loe’) de Jong (1914 – 2005) was a Dutch historian and journalist. 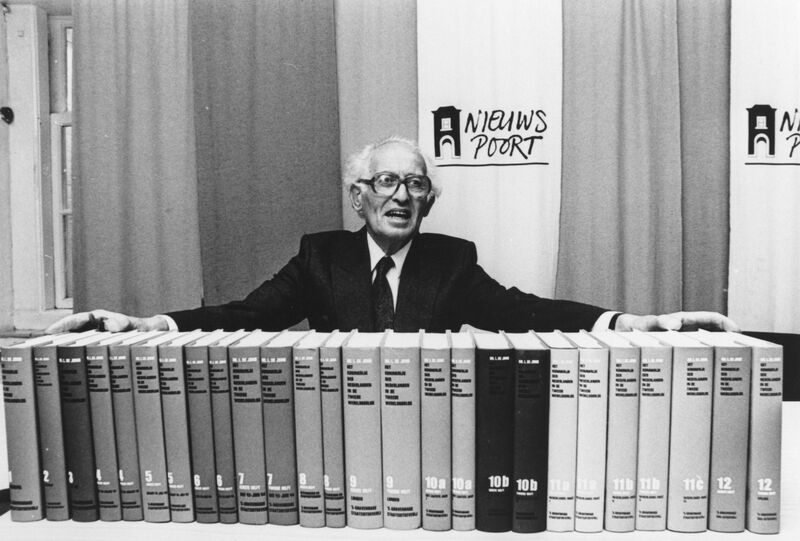 He became known as an expert on World War II because of his 14-volume standard work Het Koninkrijk der Nederlanden in de Tweede Wereldoorlog [The Kingdom of the Netherlands during the Second World War] about the Netherlands and the Dutch East Indies. Except for the last volume, most of it was written by De Jong himself. In the next-to-last year of the war, Lou de Jong managed to make Gerrit Bolkestein, the then minister of education, enthusiastic about the idea of establishing a national institute for collecting documentation about the Second World War. He was not the only one with that idea, for in the occupied Netherlands professors Jan Romein and Nicolaas Posthumus had a similar idea. The result was the establishment of the National Institute for War Documentation (RIOD) on 15 September 1945. The institute’s name was later changed to the Dutch Institute for War Documentation (NIOD). The Kingdom of the Netherlands During World War II (Dutch Het Koninkrijk der Nederlanden in de Tweede Wereldoorlog) is the standard reference on the history of the Netherlands during World War II. The series was written by Lou de Jong and completed in 1994.